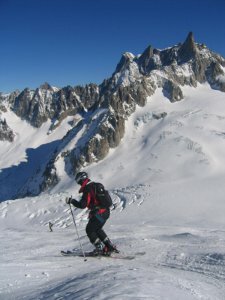 There are more than ten main ski routes in the Vallee Blanche. Depending on the technical level, the snow conditions, it's possible to choose one of all this options. 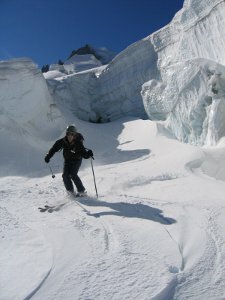 The "classic "Valley Blanche" avoids all the steepest areas of the Glacier du Géant. This is the original descent done in february 1903 by the Docteur Michel Payot with the famous guides Ravanel « Le Rouge , Joseph Simond and the chamonix ski guides René Payot, J Couttet et Henri Devouassoud. This is also the easiest route but even if a few touristic offices describe it like a red slope, this is not true, the snow conditions and the weather can increase a lot the difficulties. The scenary is superb with the best views in the high mountains. The "italian route" from Courmayeur is an interesting variant if you want to avoid the descent of Aiguille du Midi ridge. 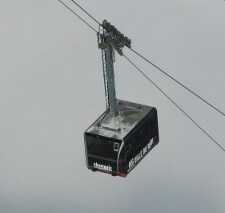 You take the Funivie Monte Bianco cable car close to the italian board at la Palud. You will put the skis on at the Helbronner peak which is 3500 meters high. The difficulties are comparable to the classic valley Blanche: with a main track and wide fields of snow. The Italian route joins the classic a bit before the shark (Requin) mountain hut.. The glacier of the "virgin" is an other combination starting from Helbronner. You traverse to the right towards the col du Géant, at this path you turn left for reaching a very wide valley very conveniant for off piste skiing. 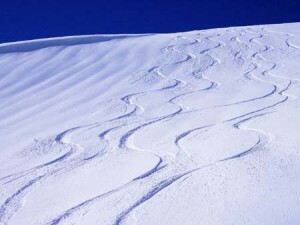 On perfect slopes, it's often possible to make your own tracks. You join the classic route just before the main icefall. The glacier of the "black virgin" is a variation of the previous descent, you must traverse all the upper flat section of the glacier du Géant to the left until you reach the bottom of the tooth of the Giant. A very interesting route follows the right river the of Giant glacier down to the bottom of the ice fall just in front of the Requin hut. Very impressive views on the ice falls and the Vallee Blanche. The "Toula glacier" is not the vallée Blanche but it's very close to the Italian Route (this is the same departure on the top of the funivie Monte Bianco). One of the best off piste skiing spots, entirely on the italian face of Mont Blanc, from the Helbronner peak, summit of the italian cable car down to Cournayeur at the bottom of the valley. The "Gros Rognon" is one of the best variant of the vallee Blanche, the slopes are very wide.. This is an excellent oppotunity to taste your abilities on off piste skiing in the fresh snow. The commitment is little, you're never far from the classic route and you can join it almost anytime you want. There is less people on this area and you can leave your signatures often in an untouched powder snow. "The true Valley Blanche" is an option just on the left of the big rock called the Gros Rognon. this is a very wild route with a very spectacular entrance through an icy labyrinth. cliffs on a wilder part of the glacier du Géant. The envers du Plan a very classic off piste area for the good off piste skiers. Many combinations are here possible for being alone and for making your own tracks in the snow. The "Grand Envers" is the most difficult route. The descent is very difficult and commited. The slopes are very sustained with a gradient 40 to 45 degrees. The fall is sometimes not envisageable and you must have a very good ski level with a perfect control of your turns. For only the best skiers. -By train if there is not snow enough for arriving to Chamonix. *a very difficult variant through the forest in steep couloirs.